As another season dawns upon us it is customary to give our general feelings towards the season and what our hopes and aspirations should be. For me Koeman faces two challenges, primarily how does he replace the goals left behind by Lukaku and secondly how does he accelerate the development of a young squad. The overlapping point for both will require him to bed in a new set of signings quickly. The business we have done so far has been positive but ultimately not complete. At the start of the summer there was a broad consensus on what was required; a Goalkeeper (Pickford) Centre Back (Keane) full back cover (Martina) a goal scoring midfielder (Klaasen) and cover up front/in wide areas (Sandro & Rooney). The inevitable sale of Lukaku, Barkley stating his desire to leave and Mori picking up a long term injury have meant we need replacements in those 3 key positions which have dragged on longer than most of us would have wanted. We shouldn’t lose site of the positive bits of business the club did do proceeding this though we should by no means gloss over the delays in acquiring the final three players we require. Talking briefly on each of the lads we’ve brought in, Pickford and Keane look to have settled the best. This should not come as a surprise as both have experience of the Premier League and come off the back of outstanding seasons. Keane looks a cut above any of our centre halves and you can see why he was courted by both of the Manchester Clubs and Liverpool. For me he has more raw ability than Van Dijk, Alderweireld or Fonte had when they first started working with Koeman and Everton fans have to be hopeful that Koeman can emulate a similar level of improvement that saw the first two emerge as the leagues best centre halves under his stewardship. I am probably not quite as sold on Pickford as a lot of Evertonians seem to be. His height is a worry for me and will continue to be so. However there is a confidence and clarity of thinking with him, both in the saves he makes, how he commands his box and his distribution that will make him a step up on any goalkeeper we’ve had since Nigel Martyn. The hope will be that he saves Everton points this season. Of the others there have been moments of promise. It’s fair to say Klaassen, Rooney and Sandro would all benefit massively from having a lad like Giroud or his ilk to play with. I don’t think Rooney has been anywhere near as bad as has been suggested in the Europa games. Though far from his best in those games he showed all the positional discipline and game awareness that became a trademark for him in his United years in away legs of European ties. Sandro still looks short of match fitness but looks a livewire and akin to Jamie Vardy or Radzinski and Klaassen you sense will ghost in and out of games hopefully with a killer punch as opposed to control them with a killer punch. All 3 work incredibly hard off the ball and fit more easily the ethos and approach Koeman wants. If Everton are to make an improvement on last seasons league position we will have to get an awful lot right. While none of the 6 teams above us have markedly improved (City perhaps having the best window) you also sense none of them have regressed massively either. That makes closing the gap a challenging though not impossible venture. For example the potential for Spurs to struggle at Wembley exists though must be balanced against the reality of a squad that has shown a real resilience and overcame each hurdle they have faced to progress in terms of points year on year. What this amounts to for Everton is a very real possibility Everton could amass a records Premier League point total of 73+ points and still finish 7th. Unfortunately we operate in a league where 6 of the teams are amongst the top 15-20 wage spenders in Europe. Within that context it seems unduly pessimistic for the caution of the article, and potentially unrepresentative of what I am trying to argue. I feel we are moving in the right direction, but there needs to be a patience that this season to some extent will be transitional in it’s composition and an understanding even a huge improvement may not be enough to display a higher league place. The idea of a transitional season has been thrown about as a lazy stereotype amongst football pundits for some time. It has become particularly prevalent now as managers regimes are cut shorter and shorter, so much so that most seasons for most clubs are often described as “transitional”. It has also been allowed to become a by-word for “disappointing” ‘underwhelming” or “underachieving’. The Everton team that played our first competitive fixture had only 2 lads involved who were around the first team squad under Martinez (Davies it’s fair to say emerged in the summer he left). This is an enormous transformation of a squad and will inevitably place challenges on the manager who has to oversea and manage such change. This is the essence of transition involving moving large quantities of players in and out of the club with the goal of moving forwards in the more medium term as opposed to just treading water in the short term. The other notable factor in the games before the season has been the number of younger players involved. The team that started against Sevilla had 7 lads 24 and under starting (Keane, Pickford, Holgate, Sandro, Klaasen, Calvert Lewin & Davies) and an average age of around 25. A comparable analysis of Liverpool’s likely starting 11 based on their pre-season games is they may have 1 lad who is 23 and below starting (Alexander-Arnold) and this is due to injury to Clyne, while Can may swell the numbers to 2. Yet within football parlance Klopp is seen to be a progressive manager with younger players and Koeman has received criticism from some quarters of being reticent to involve young players! Often such comparisons are irrelevant but this is very telling to the challenges Everton face and how media management can often distort the concrete realities of how a manager performs. Whether Koeman likes it or not his ability to continue to develop young players will play an integral part in how successful he can be at Everton. This alone should be grounds for optimism for Evertonian’s as the reality is the squad we have will likely get better as they begin to grow into their prime years. Yet Koeman’s input remains central on this and we mustn’t fall into the trap of thinking young players automatically get better without the correct management. Two years ago we had a promising crop of players, led by Stones, Lukaku, Barkley and Deulofeu and with younger players such as Galloway, Garbutt, Browning and Pennington showing promise. Due to a combination of loans and transfers none will play for Everton this season and only Lukaku (with the intervention of Koeman) has really lived up to hype. A lot of the risks associated with the above players will hopefully not exist as readily with the current crop of younger players we have. Koeman’s own attitudes to youth are paradoxical and he gets an unfair press on the issue. He often has the rhetoric of a latter Moyes or Smith yet is willing to expose young players significantly more than his often downbeat assessments suggest. In December last season he said none of the young players were good enough for the first team and within a month Davies had made himself an integral part of the team while Holgate, Calvert Lewin and Lookman would be getting minutes. 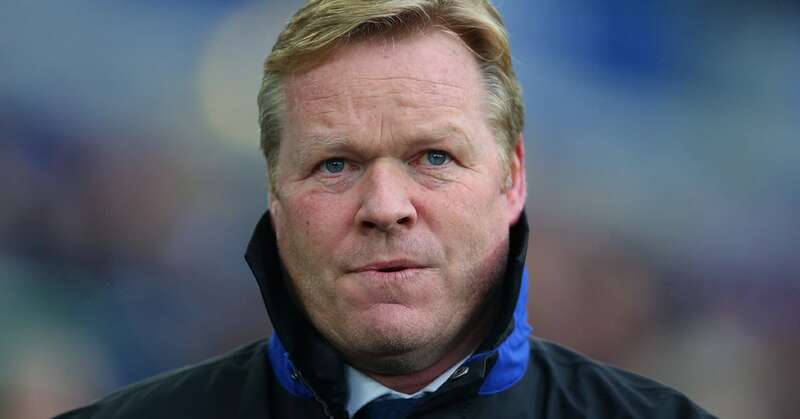 It’s hard to know whether this was an approach in tough love, whether circumstances conspired against Koeman to force his hand or if his general pragmatic realism mired with caution in praise of players underpins this contradiction? What we do know is young players have been given opportunities under Koeman and this looks set to continue. Calvert-Lewin in particular has massively impressed me this pre-season (albeit he still has many doubters within the fanbase). He seems to have grown over the last 6 months and is a sizeable bulk of a lad, who possesses a leap as good as any player I’ve seen in blue (up there with Speed, Cahill and Ferguson). At his height, with that leap and workrate if used correctly he could be a real handful in his preferred central position in games this season. Koeman’s praise of him, beyond any he has given to any of the young players including Davies indicates he must be a consummate professional who works hard in training, which is an important an attribute as any of the technical ones. While Lookman and Kenny may catch the eyes of supporters more, often a manager is looking at a specific skill a young player can add, and it’s clear the physicality and aeriel prowess of Calvert Lewin will get him minutes. There is some concern (not least from myself) as to the lack of involvement of Kenny and Lookman. I would go back and urge a little caution on this. We have a very young team and we do need to be careful to mix youthful exuberance with the right experience to win games. Had we still been managed by Moyes I’d have been massively concerned Martina started ahead of Kenny, as you would have felt that back four would be drilled for the next 12 months and Kenny wouldn’t get a look in. Koeman is far more fluid in his selections and unwilling to accept sub par displays. If Kenny and Lookman can stay around the first team squad, opportunities will come and they may well benefit from being held back a little longer when given the chance to take them. This seems to underpin my cautious optimism about Koeman’s approach to younger players. While Moyes and particularly Smith could be criticized for not exposing them it became clear with Martinez that any initial boost lads like Barkley showed in being given an opportunity soon leveled out as the expectations were not set high enough. My own feeling was for Barkley, Lukaku, Stones and Deulofeu there was an almost a guaranteed place in the team irrespective of form or application. Lukaku would suggest much of the training/approach was based around himself and Barkley, we are aware Deulofeu regularly flaunted time deadlines for training (indicative of a wider malaise and work rate) and Stones took to doing Cruyff turns in his own 6 yard box. This would suggest a group of talented players who were led to believe that rather than have to strive for a place in the team, they could take enormous liberties and still get a game. Such a process and approach meant none of the 4 fully capitalised on the opportunities the opportunities handed to them from Martinez. In all honesty over and above any other player I feel all 4 let Martinez down. By contract Koeman appears to have adopted a nice mix of the standards demanded by Moyes but the willingness to expose younger players of Martinez. They get opportunities, but if they don’t perform well enough, like anybody else they are dropped. This should maximise the hunger they have and make them better footballers as a result. For Everton to continue to progress this season we are gambling on that continuing. In lieu of the ability to sign a Costa, Aguero or Harry Kane it is currently a gamble we have to take. A similar gamble exists on whether we can replace Lukaku’s goal. It is of course a gamble we have to take, as we are unable to attract a 25+ goal a season striker. Goals have been added, Rooney, Klaasen and Sandro are all capable of 10 league goals each. If we add a target man and Sigurdson who can add 10 apiece each we will not miss the goals Lukaku has offered, but it is a big risk and requires each of the above to be on their games. It is also reliant on us finalising key bits of summer business and not repeating last seasons debacle that saw us missing out on key targets and only acquiring Enner Valencia on deadline day. While I have presented a pessimistic picture of what can be achieved we should bear in mind two points. Firstly the supposed “top 6”Liverpool fans keep banging on about is as illusionary as any “top 7” we go on about. It always makes me laugh when they mock us for making up a top 7 for not being realistic while failing to acknowledge last season the marketing campaign of Sky of a Top 6 (featuring sides such as Livepool who finished 8th the previous season) was equally illusionary. While the concrete reality is all of the above have significantly higher wages than us Leicester have proven that the Premier League remains an extremely fluid league currently and any hope that prevailing orthodoxy’s return (and believe me the powers that be are desperate for that to happen) is a forlorn one. With no imperative to sell and funds that allow any Premier League side to attract a quality of player from the continent previously only accessible to 3 or 4 sides there is enormous opportunity. It will be a massive challenge for Everton to breach the gap, but significantly easier than the one that faced us 10 years ago. The second is, Everton need to have half an eye on next season. 12 months bedding in for Pickford, Keane, Sandro and Klaasen, alongside the continued development of Kenny, Davies, Lookman and Holgate opens up enormous opportunities for Everton. While you would expect Schneiderlin, Gueye, Siggurdson, a new target man to remain central figures at Everton we are seeing a passing over of the guard. With more hopefully more investment to come in January and next summer Everton’s aim needs to be to develop a nucleus of a side that can challenge to win all the competitions it enters, and this season will hopefully be a substantial step forward in this regard. Oh and if we have to finish 7th again, can we please win a Trophy, at least to put the sorry urchins that exist across the park out of their misery as they remind us what we’ve won in the last 20 years while ignoring their own record is 1 league cup (against footballing powerhouse Cardiff) in over a decade. The lack of irony just won’t do anymore and they too need to get back to signing about their own team. It would be an act of kindness all around in keeping with the exceptional work of EITC.